As of September 2014, we at Ernst Basler + Partner distribute the application GISconnector for Excel in Switzerland. GISconnector is a software created by Germany-based GI Geolabs. In this article, we highlight the new possibilities that arise through the close interconnection between ArcGIS and Excel. Contact us if you have any questions or if you’re interested in a demonstration in a screen sharing session. 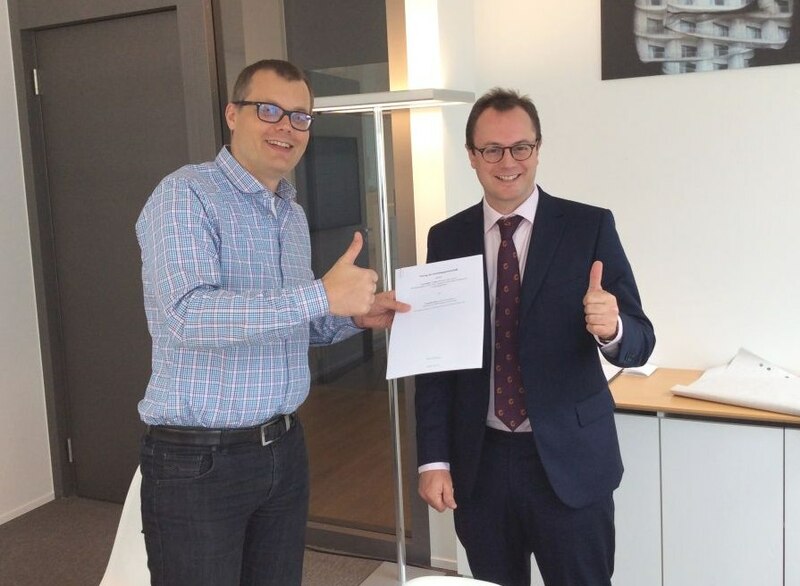 Stephan Heuel of Ernst Basler + Partner and Matthias Abele of GI Geolabs after signing the partnership agreement. But first things first: What does GISconnector offer to you? It combines the capabilities of ArcGIS Desktop and Microsoft Excel in a smart way. The best thing about it is that you can do all the attribute-related steps in your GIS workflow seamlessly in Excel. This way, you have the power of a full-fledged spreadsheet software at your fingertips, perfectly integrated within ArcGIS. As a result, working with attribute data is much easier and takes a lot less time. You can find a comprehensive list of GISconnector’s functionality here. Working with GISconnector usually follows this pattern: I load a feature class (Geodatabase or Shapefile, whatever floats your boat) as a layer in ArcMap. Using GISconnector I can conveniently export the layer’s attribute data to Excel and create a connection between the two programs in the same process. From this moment on, I can easily swap selections, definition queries and filters between ArcGIS and Excel. The same applies to changes in attribute values and attribute names as well as adding attributes. A toolbar lets you control GISconnector both from within ArcMap and Excel. Sending selections, data et cetera from one application to the other takes just one click. The image below shows a simple example of GISconnector in action: A feature class of Swiss cantons in ArcMap and the connected attribute table in Excel. I selected some of the southern cantons (marked with turquoise borders) in ArcMap and then sent this selection to Excel as a filter. Thus, Excel only shows the three rows related to the selected map features. Further, the connection between the two applications lets ArcGIS users access Excel’s advanced bag of tricks, ranging from complex functions and AutoFilters to conditional formatting and dynamically updated charts. I will write about such an example in an upcoming article. Have we sparked your interest in the GISconnector? Learn more about GISconnector’s functionality from the makers of the software. Test the product free of cost. Contact us if you have any questions or if you’re interested in a demonstration via screen sharing.